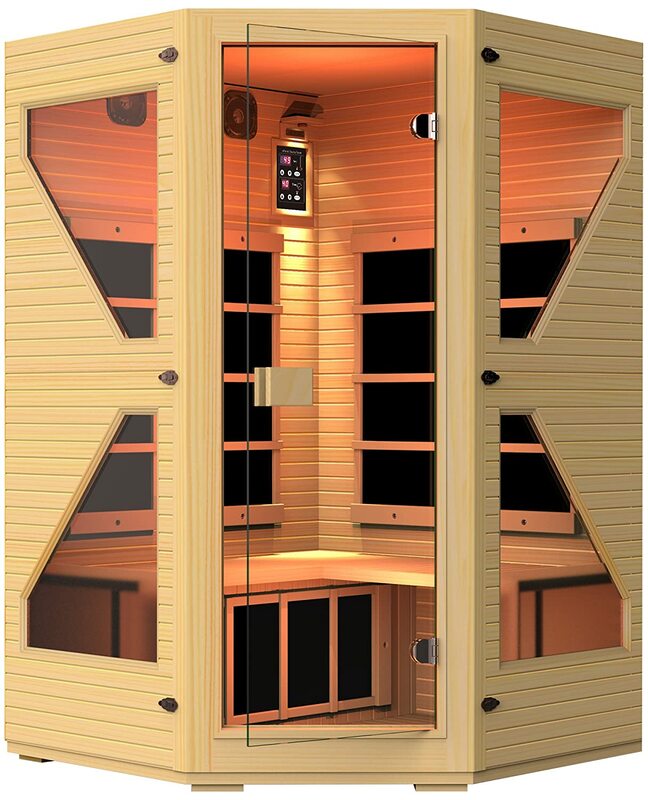 Infrared saunas are modern equipment that utilize infrared technology. These machines provide heat and enables the user to get the same benefits as a regular sauna. They come in an array of designs and buyers can get the best infrared sauna based on their needs if they know exactly what they’re looking for. If you’re looking for the best infrared saunas, you’ve come to the right place. Here we provide you with a list of the most sought after products in this category. This infrared sauna is constructed using Canadian Hemlock wood, which is taken from reforested wood to help save the environment. All wood materials used are thick to retain heat while promoting faster heating time. This product gets a lot of positive reviews because of its design. It is compact but it can still accommodate up to two people at the same time. It is equipped with energy-efficient panels that guarantee better heating. Heat emitted will penetrate the skin better by up to 30 percent, which guarantees a more effective therapy. With this sauna, people can easily know the current temperature and adjust it to suit their preference. It comes with a music player to help with the therapy process. Since the unit has a straightforward electrical system, you don’t need special wiring modifications to power it. The entire design is also great because of how wood materials are pieced together. It’s considered the best sauna for outdoor use due to its design that suits every property type. Buyers won’t have any problem placing all the pieces together due to the lightweight wood materials that make up this sauna as well as the easy setup procedures. 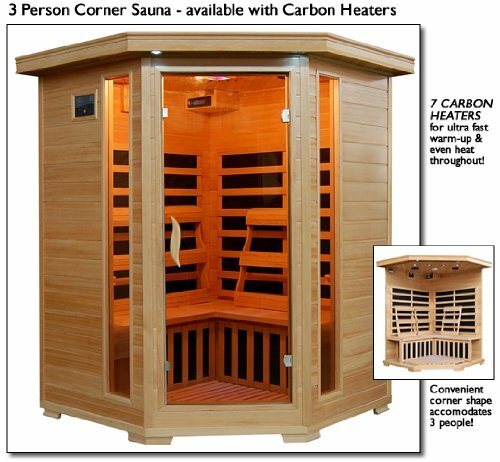 Allowing up to three person to use it simultaneously, the 3 Person Sauna Corner Fitting Infrared FIR FAR 7 Carbon Heater is great if your family loves to use a sauna. In fact, it’s the best infrared sauna for 3 people. It comes with lovely pieces of prefabricated solid Hemlock wood to ensure fast and efficient heating. Putting all the pieces together results to a compact and classy home sauna. As one of the best infrared saunas, this model can heat up in 30 minutes, so you don’t have to wait too long. However, those who prefer a tempeature of 125 degrees or higher must wait for 50 minutes. The heat produced promotes positive effects in muscle relaxation, acne reduction, and in promoting deep sleep. People can further relax by taking their favorite drink inside while they are in the sauna and place them on its pre-built cup holders. These cup holders are designed to prevent accidental spills. If you want to stay inside for a longer period, you can just put some reading materials in the magazine racks that are included in your purchase. 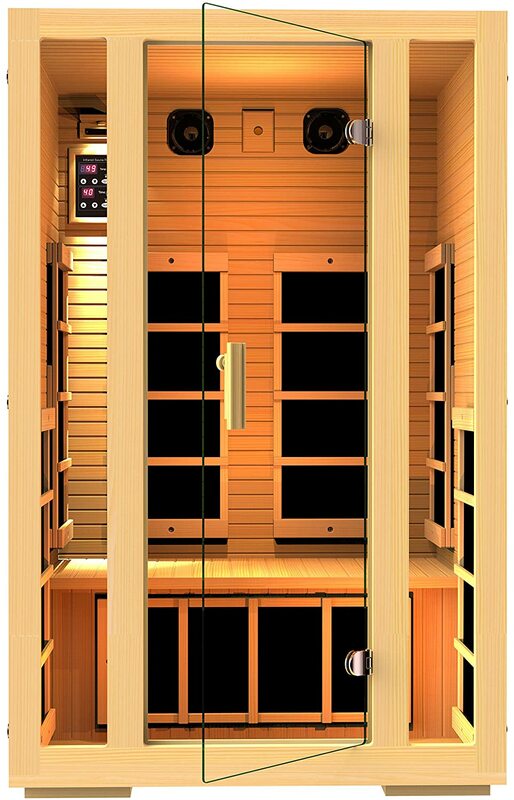 The JNH Lifestyles 2-3 person corner Far Infrared Sauna is more compact than all the other models in this list but interestingly enough, it has more space than other saunas with larger frames. Its main frames are made from Canadian Hemlock T&G timber which is known to provide good heat insulation. This model makes it to the list of the best saunas because it can accommodate up to 3 people despite its compact design. However, taller people or those with larger frames won’t be comfortable inside. It’s a top infrared sauna – just not so much for taller people. The JNH Lifestyles doesn’t need electrical modifications, which means it can be used immediately after installation. No need to change home electrical systems to create dedicated lines just to be able to get it to work. When it comes to heat emission, this model heats faster than other models. The starting heat temperature is around 65 degrees and it will increase one degree per minute. However, it may take a while for the sauna to reach 100 degrees. This unit is even more compact compared to other JNH models, so it’s perfect if you have limited space in your home for a sauna. The materials used are solid “Green” Wood that are guaranteed chemical-free while promoting good insulation and framework. High quality wood contributes to its heavy construction. Piecing all parts together is easy, especially for people who are adept in building things. However, wood pieces are heavy, which means getting help from another person will make the process easier. Putting the pieces together is easy, but the instructions are difficult to follow. We consider this model to be one of the best saunas, but only if you can decipher the manual! 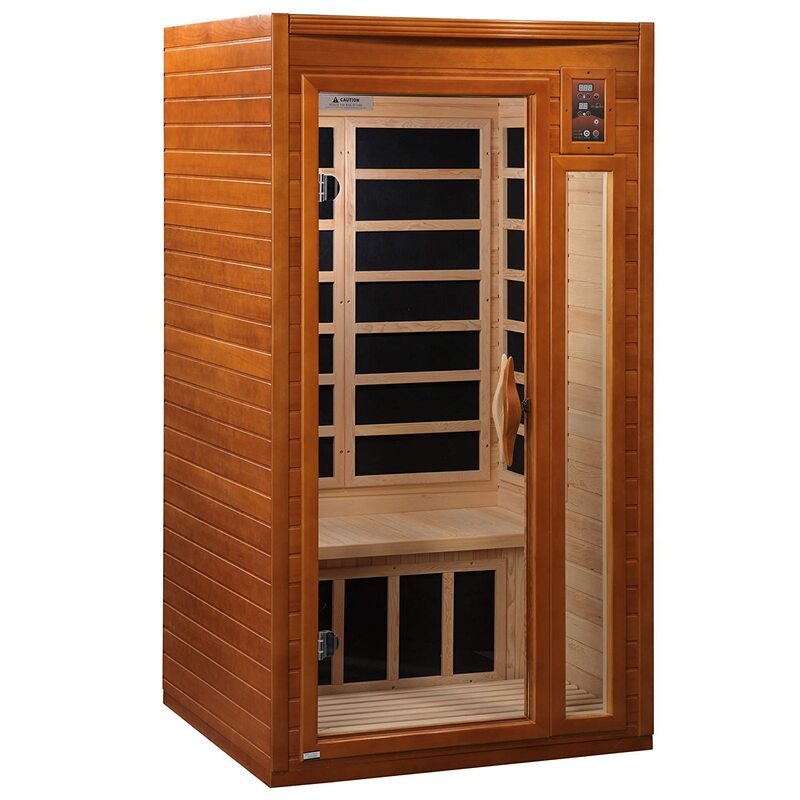 This sauna comes with a five-year warranty, which is the most extensive warranty available for infrared saunas. This pretty much gives you confidence in the durability of this product, so as long as you know exactly how to properly use it and maintain it. This portable sauna boasts of a small size and lightweight features. It weighs around 270 pounds with the chair included. This means the entire chair can still be brought everywhere because of its size. Space is also a not a problem because it unfolds to give extra width or length for comfort. But despite the small body, the sauna is not that easy to set up in small spaces. This is due to the extra length meant for comfort. Additionally, the sauna’s front part doesn’t have supporting braces to keep it from standing. You will need to use your feet to prop up the front insulated panel. The heating system that comes with your purchase promotes faster sweating. In fact, the heat is enough to make a person sweat in less than 15 minutes. This fast result is also made possible with the insulating system that comes with the sauna. The fabric ensures that heat will remain inside the sauna and provide excellent heating. You don’t have to worry about getting another chair with this portable sauna. That’s because it comes with its own sport canvas chair. This model’s overall look makes it stand out from among other portable saunas. The insulated fabric has a different color, taking away from the usual silver fabric found in portable saunas and body suits. Another special feature that it has is that it is electromagnetic radiation-free, which ensures the safety of the user. That means you don’t have to worry about infrared sauna dangers even when you use it regularly. 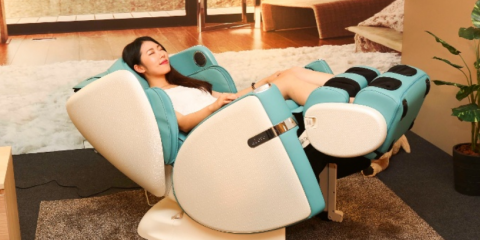 It has similar features to other portable saunas like a foldable canvas chair, but the manufacturer threw in something extra – the heated footpad. The footpad makes up for the small seat, which can be uncomfortable for many people. However, users can still get a different chair every time they use this portable sauna. While it provides good results, the portable sauna doesn’t come with a step-by-step guide for setup. The setup process is straightforward, but it would have been nice if it has its own setup guide. Heat temperatures can also reach up to 150 degrees, which is great if you want to sweat fast. This temperature is the highest temperature settings you can get from portable infrared saunas. Infrared saunas have been widely used in Japan for Waon therapy. This kind of therapy refers to soothing warmth therapy that has been used in improving cardiac function for patients. A patient who needs this therapy should get it repeatedly to be able to get its benefits. An infrared sauna comes with different parts. This includes the main heating elements, which are usually carbon heaters or ceramic heaters. Both heater types come with an array of differences. Carbon heaters come with thin carbon plates. These things also emit rays almost similar to far infrared, which is the heat needed for therapeutic purposes. Infrared saunas offer an array of benefits. Taking the Waon therapy for example, a study published by Mitsuo Sobajima, et al. explores the therapy’s effects in improving quality of life among patients with chronic heart failure. The study showed significant improvement on both physical and mental component quality of life among the sample. Richard Beever, a Clinical Assistant Professor at the University of British Columbia, summarized published evidences of far infrared sauna’s effect on cardiovascular risk factors. Other indications discussed includes far infrared therapeutic effect on chronic pain. According to the study, patients who underwent therapy were likely to have returned to work, which suggests positive effects of infrared therapy as a promising treatment for chronic pain. This kind of therapy is also used as treatment for chronic fatigue syndrome and reproductive health improvement and these have been highlighted in the summary. Beever reported that the summarized results showed no signs of adverse effects on patients who underwent the therapy. This supports the lack of infrared sauna dangers people often associate with infrared saunas. A lot of people today use infrared saunas for weight loss, skin improvement, and relaxation purposes. Infrared saunas are the modern sauna alternatives and have major differences with other sauna types. Wood-heated saunas are considered the older types of saunas. These things use wood-burning procedures to produce heat. Unlike infrared saunas, wood-heated saunas don’t need electricity and require a vent or a chimney to release smoke. Many people like wood-heated saunas because of the crackling sound produced by burning wood. Some people listen to this sound as part of their therapy. Savu saunas are among the common types of Finnish sauna. They are also considered as the grandparents of modern saunas due to its design. Unlike wood-heated saunas, savu saunas don’t have chimneys. The smoke will be contained in the room and used for heating. Smoke is produced by burning in a large stove. Throughout the process, the fire will die, which means more smoke will be produced. Smoke will be released or ventilated out. Heating will continue to circulate inside the sauna as the residual will be sufficient to make this possible. While it’s already an old type of sauna, a lot of houses in other parts of Europe are still using this type today. They consider it the best sauna due to easy construction with cheaper costs since chimneys are not required. A steam bath is also among the common ones found today. They are being used in gyms, health clubs, and public baths or water spas. This type of sauna is also among the oldest types of saunas and their history traces back to the Roman era. A steam bath utilizes steam to heat the sauna. It has pipes and pumps that promote steam production. Spas today often have sauna facilities. People can go to a spa to enjoy its therapeutic effects. But keep in mind that while you can certainly get the benefits of sauna in a spa, there’s still a world of a difference between going to a spa and having your own infrared sauna at home. Going to spa means the facility is ready for clients to use. They simply need to book their appointments then arrive at the spa to enjoy sauna’s therapeutic effect. Clients using this service may pay for the use of the sauna only or as part of their spa package. If you only plan to use a sauna once or twice a year, you may be able to save money when you just avail of it at the spa. But, what if you plan on using a sauna every week? In such cases, you should get your own sauna. You’ll save money in the long run if you like to use it a lot. Besides, you can find cheaper options since there are now pre-fabricated saunas that come with infrared heaters specifically suited for homes. They look like small sauna units that are very compact in size. They can be placed outdoors or indoors depending on the available space. When you have a sauna at home, it means you can access it anytime you want. You can use the sauna whenever you feel like it without having to schedule an appointment with a spa. Moreover, if you don’t want to spend thousands of dollars on an outdoor sauna, you can always pick from among the portable alternatives. Portable saunas are recommended for those with limited floor space at home. You also have the option to dismantle and fold the portable sauna and bring it with you when you travel. In the end, the choice of buying the best infrared sauna or simply going to a spa depends on your specific needs. If you will be using a sauna frequently, it will be more cost-effective for you to buy your own sauna unit so that you can use it anytime.